In Megabuyte, January 2014. Original article (£). But what this means on a daily basis is that Spencer has a 1600-people-strong company to run. Last year marked a major milestone with the roll-out of Emis Web, and the company recently launched a series of apps, including one where patients can book appointments and get repeat prescription. It’s sounds simple but of course it’s very complicated; after all, the NHS consists of 200-odd organisations, all with their own ways of running things. “It’s counter-intuitive, isn’t it?” says Spencer, pointing to how we all can get money from any cash machine and the banks sort it out behind the scenes, seamlessly. This is essentially what Emis is working on: making all the branches of the healthcare system talk to each other. An immense task of course, and one plagued with concerns over cost and security. “The NHS as policymaker want it to happen because it will be faster, better and cheaper for the public. It’s like ‘pick your own strawberries’: you’re getting the public to look after themselves,” says Spencer. “For a lot of patients the downside is around security and information floating around in the Cloud, so there’s an education piece.” Then in the middle there’s the clinicians, who have all sorts of reasons for not wanting to share information. “They might say, ‘It’s a record where I make all sorts of notes.’ You know, historically they might have made notes like DTS, for the fuller figure.’” Spencer leans forward, conspiratorially: “That means ‘Danger To Shipping’.” I laugh, horrified. Digital transformation, it seems, may have unintended consequences for bedside manners. This is where Spencer tells the story of his eye surgery: earlier this year the CEO needed immediate surgery for a detached retina. Having been transferred between hospitals with handwritten documents, a comedy of errors ensued where the new hospital got his name wrong, his bed was given away after surgery, he was given the wrong medication, and his prescription wasn’t prepared. They operated on the correct eye though, just about. Not long after this ordeal, in September, Emis acquired pharmacy and prescribing specialist Ascribe, meaning the new world is one where a joined-up EMIS and Ascribe will hopefully prevent this sort of muddle. So all those big providers spent a decade cocking this up, and little Emis solved it? “Fundamentally, yes!” Spencer laughs. The secret to the company’s success, he believes, is not trying to do every system at once, and to not assume midwives, brain surgeons and psychiatric nurses all have the same needs. And to talk to the people doing the work on the ground and get them onboard, because it won’t work if the doctors don’t want it to. Spencer, now 56, has no plans regarding how long he wants to keep the reins at Emis, just “as long as I’m useful”. He seems the type who needs to be busy, I point out, before Spencer chuckles that his wife probably needs him to be busy too; quite driven herself, his wife works for the government handling childcare cases against parents. After a day of business meetings, hearing stories from the frontline can be sobering. Posted on 01/07/2014 by Jess. 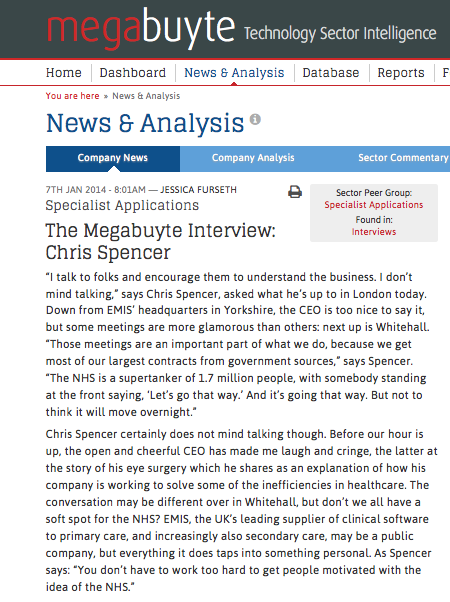 This entry was posted in Technology features and tagged chris spencer, emis, healthcare, megabuyte, software, technology. Bookmark the permalink.